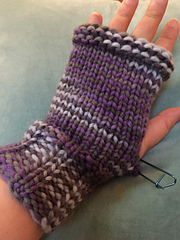 I am finding I have more to say about knitting than the people in my life are really interested in hearing, so I am launching this blog. I’m okay if few to no people read it, although it would be cool if it generated a little interest. I don’t have a super clear objective so far. My initial intentions are to discuss the highs and lows of yarn and knitting and to document an intense stashbusting initiative. As with most blogs, it’s likely that a decent dose of life and social commentary will make it in, as well. I will link my blog to my ravelry.com profile. My username there is alexand. A basic history: I have been knitting off and on since I was about 7 (i.e., nearly three decades). Generally speaking, I despise crochet except for minimal borders and the like. Nothing personal, just doesn’t grab me. I struggle with depression. How that influences me at any given time affects the role that knitting plays in my life. So, times when I have more depression, I tend to have less energy and knitting falls by the wayside. It’s not strictly a barometer, but it’s one indicator out of many. The projects I tend to work on run the gamut: hats, scarves, mitts, baby items, dishcloths, dish towels, tea cozies, potholders, blankets, mason jar cozies, pretty much anything except for an honest-to-goodness adult sized sweater (so far). On to the knitting! I currently have three active projects on the needles. 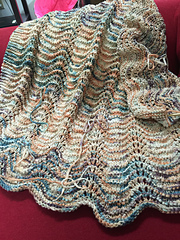 The main project is my Old Shale kids blanket. The pattern is named Feather and Fan, but I’ve recently discovered it is actually Old Shale. I am using Colinette Wigwam in colorway Morocco. Funny story…a month or so ago, my mom and I were browsing at the local “Gucci” Goodwill. We were in the right place at the right time when an employee brought out two plastic tubs of yarn. We snapped them up, paid a total of $50 for them, and divvied up the spoils when we got home. Included in my batch were six skeins of the Colinette. I cast on for the blanket, got a skein or so in, and realized I had overestimated my total yardage. I wanted four more skeins. Long story short, they would have cost about $100 total at retail price, so I bought one skein from a fellow raveler and found a site in the UK (cucumberpatch.com) that had a good price for the remaining three. I’m waiting for those to arrive and then will finish the blanket. It will probably be for my two and a half year old daughter. 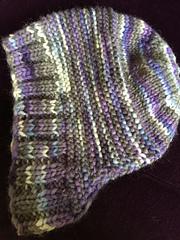 Projects #2 and #3 are a Capucine hat and Bel et Bon Mitts out of the same super bulky Araucania Calafquen (discontinued). All the knitting is done except for the second thumb. I will need to weave in the ends on the mitts and then do the tassels for the hat and they will both be done. And I am contemplating a fourth, fifth and sixth project. Can you tell I’m feeling pretty good these days? I will leave projects #5 and #6 for another post. Project #4, though, will be something quick, easy and will use up some of my less awesome stash yarn. I have a lot of yarn from previous Goodwill trips, garage sales, random box lots, and goodness knows where else. I would like to use some of it up. So, last night I pulled out some acrylic baby yarn and I’m thinking of making hats or something that can be donated. If you’ve made it this far, I am impressed! I am happy to have this outlet. Hopefully I will document an interesting knitting journey here in time. NOTE: This post was originally published on Blogher on 7/4/15, but I’m relocating to wordpress.